Although I had planned to make the Black linen-look bolero jacket today – ready for the family wedding on Sunday, this dress sneaked in under the radar. 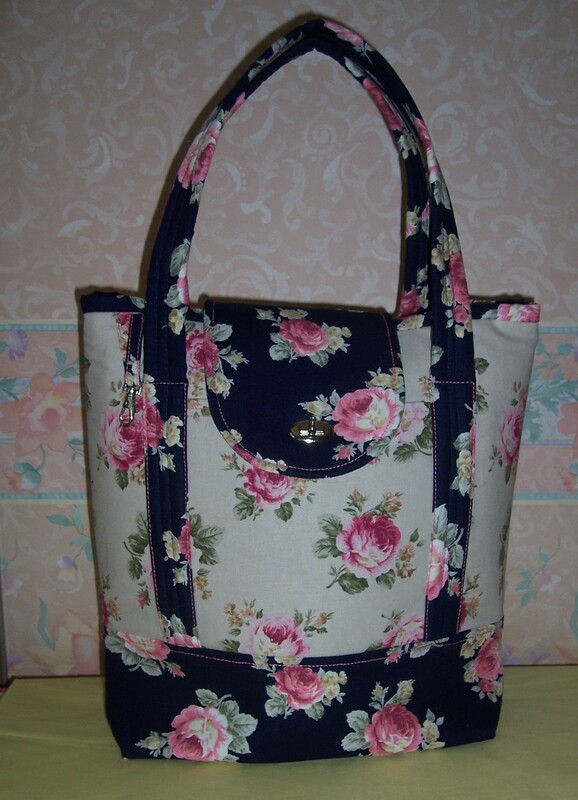 I like to have a new dress to wear on my birthday which has also snuck up on me – it’s on Monday!! 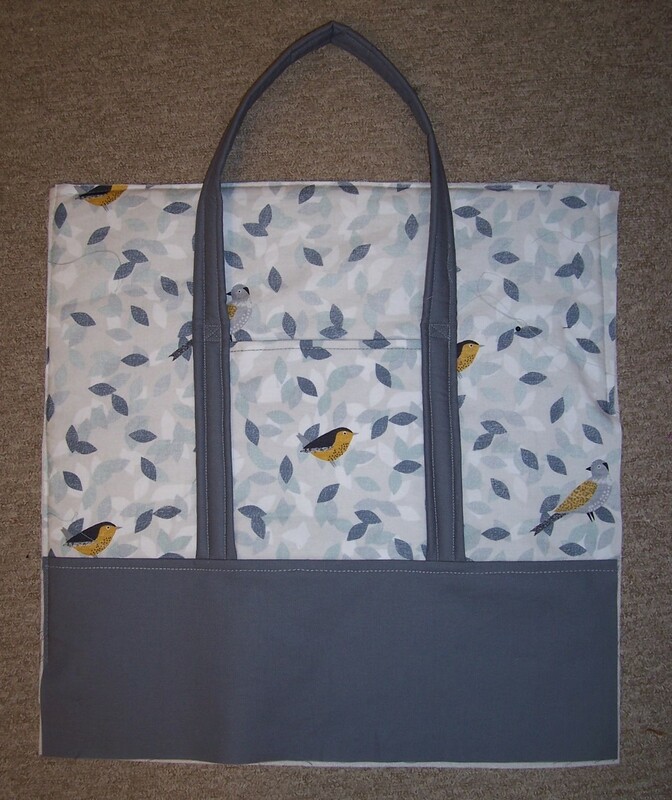 I had 3.5 metres of this pretty print ‘Chloe’s Closet’ by Moda ® ready laundered and waiting in my stash so it was straight into cutting out and stitching. I used the bodice pattern with the princess seamed front and a darted back (same as the Yellow dress posted on 18th June) and again the 4-gore circle skirt from the Betty dress by Sew Over It. The centre back lapped zip is from a length of continuous zip and is a machined insertion. The cap sleeves are lined with plain White poly/cotton and the hem is overlocked, turned up by 1 cm and machined in place. This dress is a very quick make and has not really interrupted my plans by more than a few hours, so… on with the Bolero jacket! In my quest to make a nice, comfortable outfit appropriate for the family wedding in 11 days’ (yes just 11!) time, today I completed making up a bolero-style jacket to Kwik Sew pattern K3736. 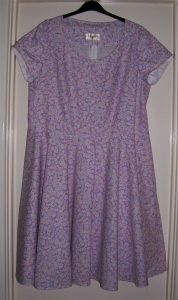 I used some Violet-coloured 100% polyester linen-look that has been in my stash for years together with co-ordinating lining. If the jacket works out OK then it can be reserve to go with the border print dress (that I have yet to make!). I cut the Xlarge size which is to fit a 43-45 inch bust. 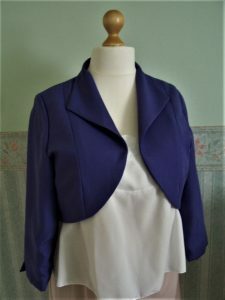 Knowing that the shoulders would be too wide for me (always seems to happen with Kwik Sew patterns) I hoped that the remainder of the pattern would also be on the generous side. The jacket sewed up quickly, I made only 2 changes. Firstly, as anticipated, I reduced the shoulder width by ¾ inch and secondly I cut a lining for the sleeves (not included in the pattern). The sleeves fitted into the slightly altered armscye like a dream although I am afraid I hashed up one them so not 100% pleased with the result. Next time I will add ½ inch at the full bust on the princess seam lines and also omit the short vent in the sleeve hem as despite really hammering it with steam pressing, one or other side of the vent consistently sticks out. Other than that, I think this jacket is a contender and I hope to be able to get another made up in the Black linen that I purchased from Franklins last week. 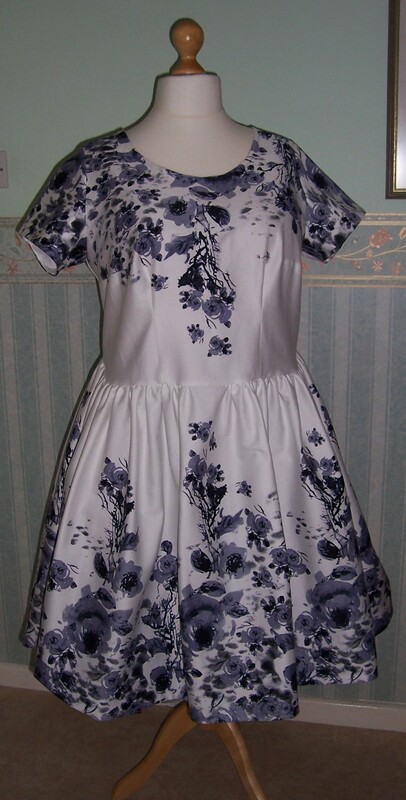 I am planning to make a new dress to wear when attending a family wedding on 2nd July. 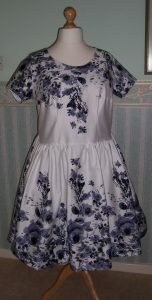 I have just two weeks to decide on the style, make a wearable muslin/toile and also the dress in the fabric of my choice. 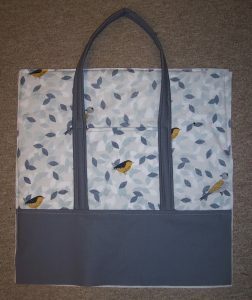 My chosen fabric is a border print cotton with a little stretch that has been languishing in my stash for far too long. 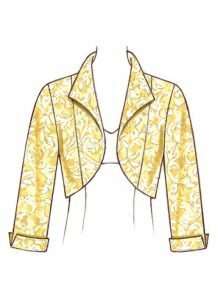 I have an idea of the style which will have a gathered skirt to showcase the border print but to date have not identified the bodice pattern. As I have several long lengths of cotton print fabric ready laundered in my stash, now is the ideal time to get stitching up a wearable muslin/toile before I cut into the border print. For this version I chose a Bright Yellow background printed with clusters of roses that was purchased from Fabricland some time last year – or maybe even the year before! To start with I decided to try the princess-seamed bodice that I used for the Yellow roses printed dress (posted back on April 10th) and combine with a 4-gore circular skirt (hack from the Betty dress by Sew Over It). 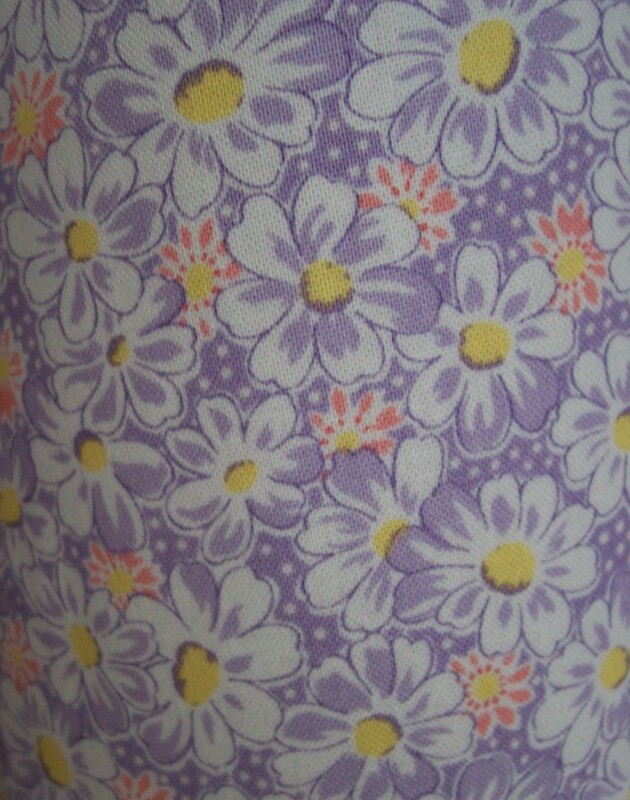 I know that for the border print I will be using a gathered skirt but as I had over 4 yards of the this Yellow background print it would be a shame not to use the circular skirt pattern. As I was uncertain of the finished width of the bodice at the waistline seam, I cut the skirt panels with an additional 2 inches in width to allow for any adjustment that may be required. 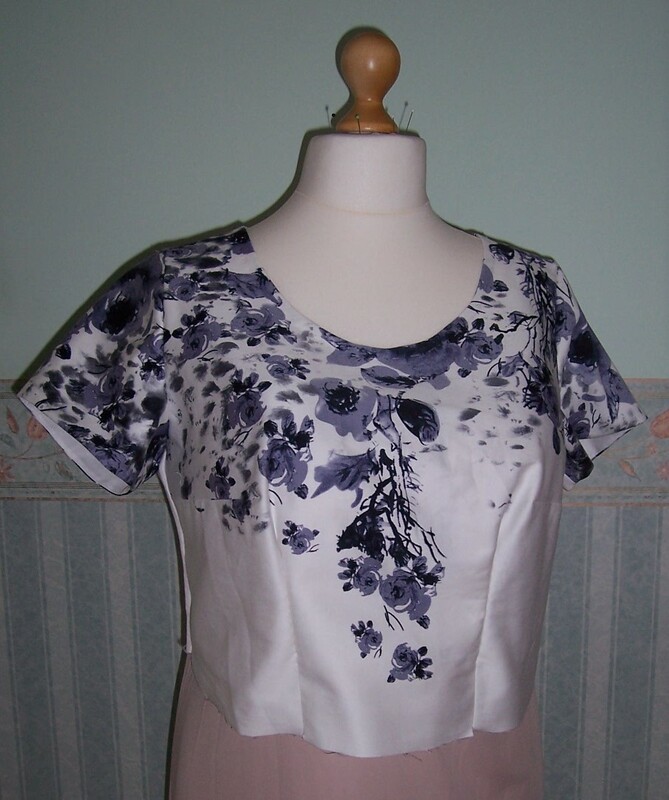 I placed the centre bodice pattern centre line on the fold of the fabric thus doing away with the button front, then cut the back bodice with a 1 inch centre back seam so that I could insert a zip. 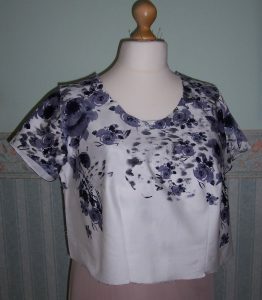 As the short cap sleeves have a curved hem, I cut a lining from plain White poly/cotton. First I made up the sleeves as they are so simple and straightforward. Then I constructed the bodice. 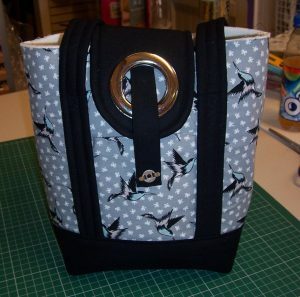 Where the previous version had a button front, this time by cutting the centre panel on the fold it necessitated some adjustment in respect of dart shaping and the side seams. Once I had made up the bodice back and attached the back skirt panels, I used a lap insertion for the zip fastening. 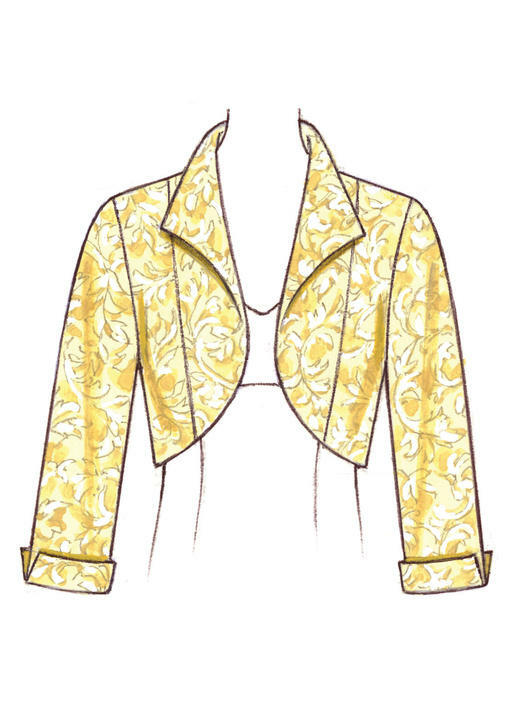 I set the zip a couple of inches down from the neckline as I prefer to leave the neckline clear of any interruption. I knew that with the width and scoop of the shaping, I would easily be able to put the bodice on over my head. The zip was required so that the waistline could open up and would go easily over my bust when putting on the dress. I added the front bodice and skirt panels before stitching the entire sides of the skirt and bodice in one seam. The neckline facing has an interfacing of plain white poly/cotton. I set in the sleeves which required a little gathering at the shoulder point as there was too much to be eased into the armscye. I have adjusted the pattern so that next time no gathering should be needed. Finally the hem of the skirt was overlocked and a narrow hem machined in place. 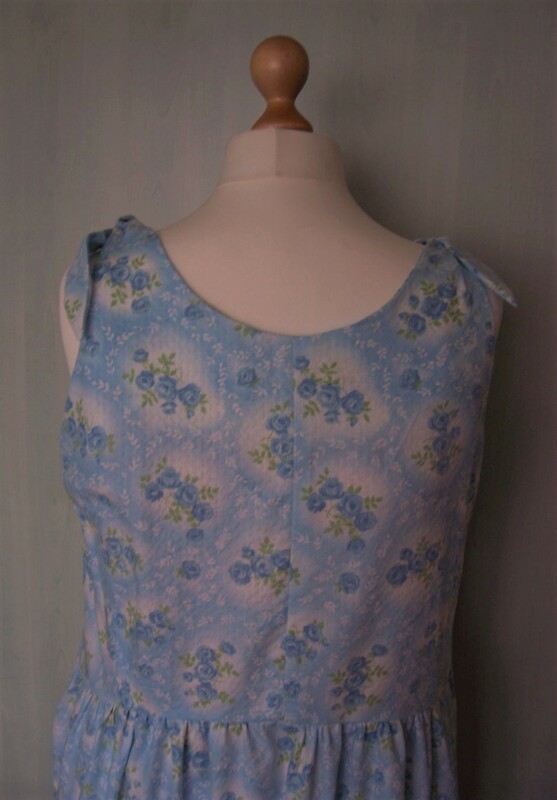 I have a new dress and completed the auditioning of this style of bodice. 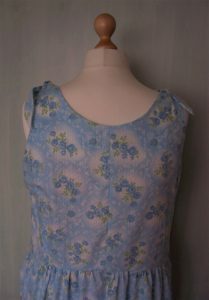 Next step is to ‘trial’ my old favourite style bodice that has bust darts and body darts at the front and back. 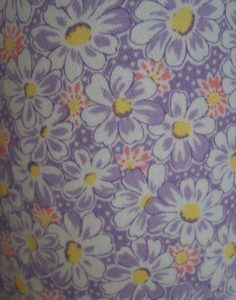 Again I will use the full circle skirt pattern as the fabric I have selected is another length of 4 metres purchased last Summer. 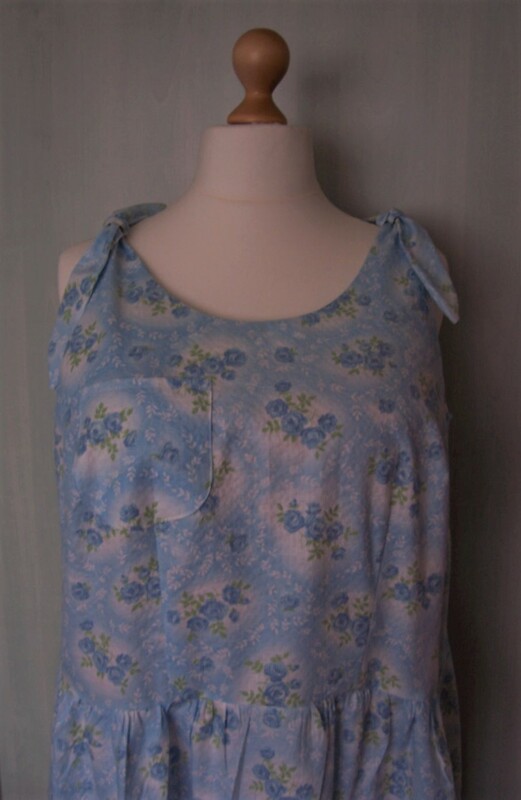 COLETTE PATTERNS ‘GRETTA’ shoulder tie tank top looks lovely hacked into as a Sun Dress. I liked the previous wearable muslin/toile so much that I have made another. Am I tempting fate with two sundresses? The fabric for this incarnation was 2 metres x 150 cms wide purchased a few weeks ago during a walk down Goldhawk Road. The stretch cotton sateen has a gorgeous tropical floral print and was lovely to work with although it does tend to fray. This was easily remedied with a quick run through the overlocker. 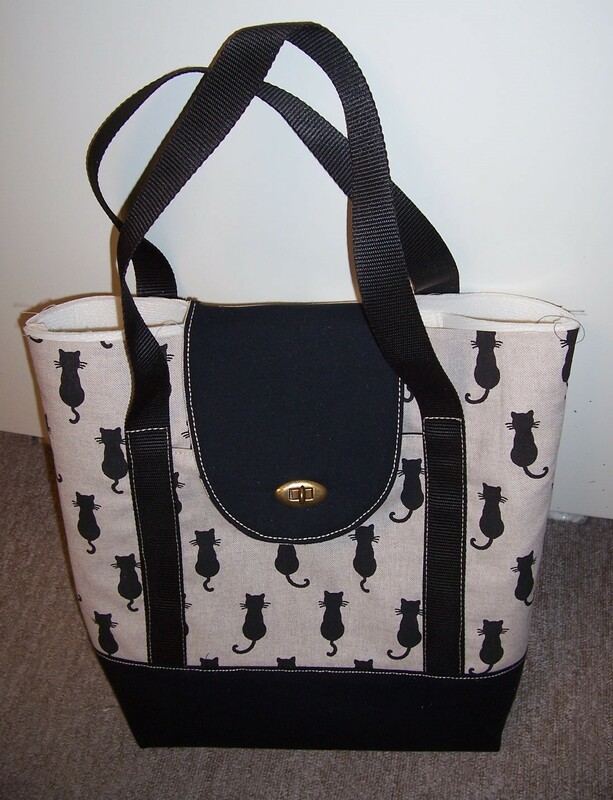 I made a few more adjustments – I like to call them refinements(!) as I found that the bodice was still very roomy. But we are getting there. I cut the skirt into four panels so that the joining seams would be offset against the bodice seams and darts. 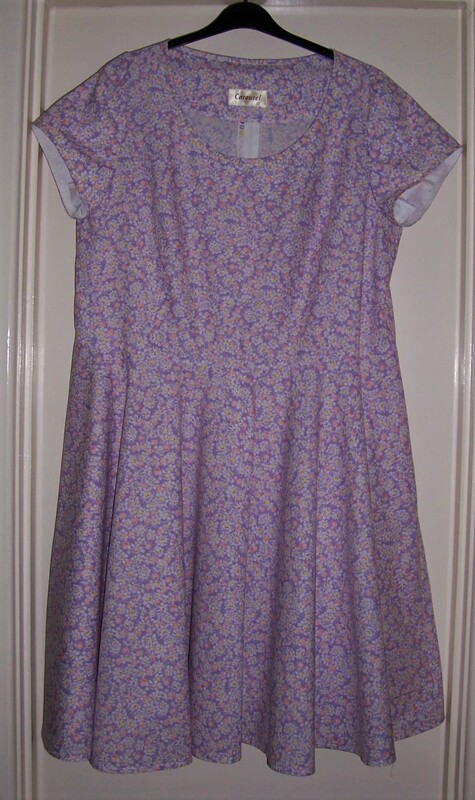 As I was a little short on fabric for the skirt it has a finished length of just 22 inches with a narrow machined hem. This has turned out just right – so I wonder if in addition to gaining width am I losing height?